On the hottest weekend of the year Legionaries from the distant planet of Tatooine boarded their transports and headed for Tython and Southern Cross Garrison Territory to bring some Star Wars fun to the Ballina Prawn Festival by being in the parade, mingling with patrons and participating in the raft building race (this race was an unofficial activity). The morning of the Galactic gathering (festival) was scorching hot, and by 8am as Rebels and Imperials assembled at the rendezvous point (local holiday park laundry) the temperature really did reflect Tatooine and its two suns. A great assortment of Star Wars characters and armed with both Rebel Legion and 501st banners, the group did not even make it out of the holiday park after kitting up, without being stopped by loyal Rebel and Imperial citizens wanting photos and clapping. More photos and excitement from the other parade participants as we assembled in the marshalling area. Some in awe, others alarmed. Information and business cards were distributed to a curious few citizens. The parade was underway on time, we preceded the local fire truck. The crowds smiled and waved and clapped and took lots of photos, and as we reached the festival grounds the crowds grew and there was plenty of interest by the time we reached the stalls and stage area. By now we’d walked 1km or more in near 40 degree heat so shade and drinks were the order of the day! We were met by the organisers who praised us and invited us to wander through the festival and keep in the shade. No arguments there! We met loads of kids and impressed adults and posed for pics and chatted to festival goers. Highlight was meeting the Prawn Mascot himself, who wanted pics with US! By 10.15am we were all wilting, and still had to walk the 1km back to our change area. 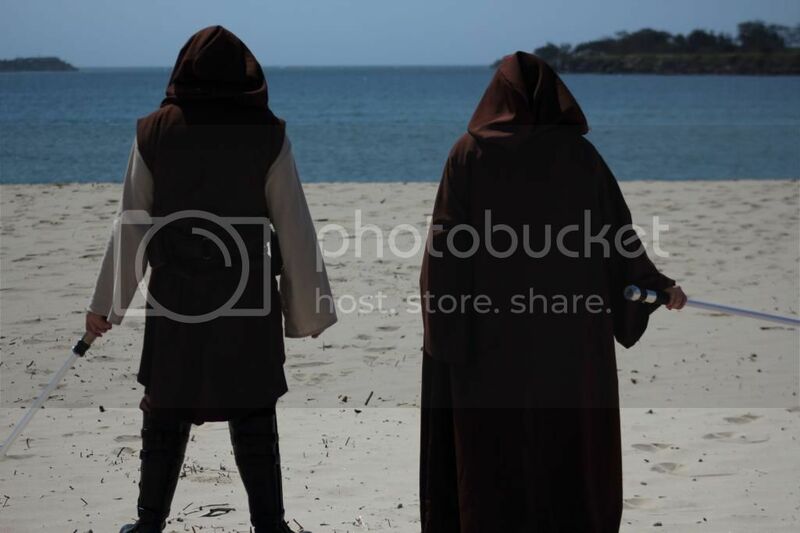 The two Jedi took a few minutes to stop by the ‘Dune Sea’ (ocean) to get a few ‘dessert’ photos and chat to a few locals. Quite a few ‘May The Force Be With You’ and ‘You must be so hot’ comments were heard! By 10.30 all Legionaries and troopers were breathing a sigh of relief and trying to cool down, dekitting and packing up. This concluded the ‘official’ part of the Mission. 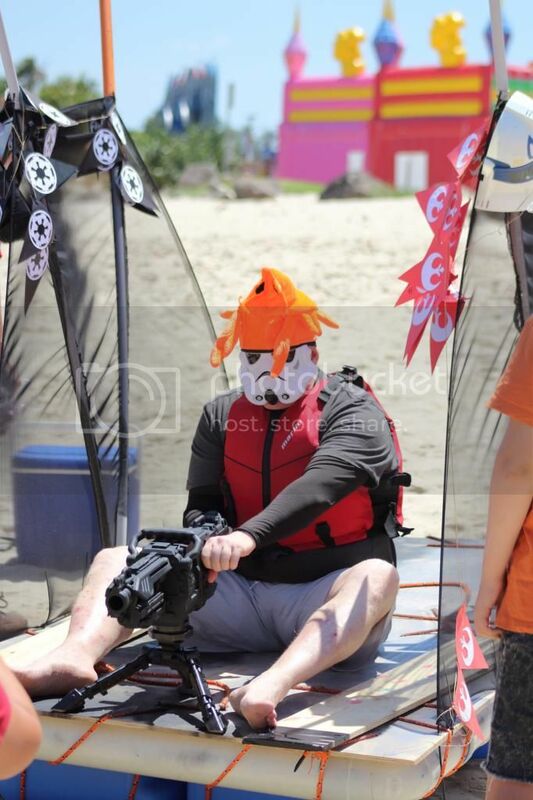 After this, TK Ratchett and Rhino representing ‘Darth Vaders Navy’ and Tobalation and Stormraven representing “The Twin Suns” participated in the raft building race as part of the Festival. 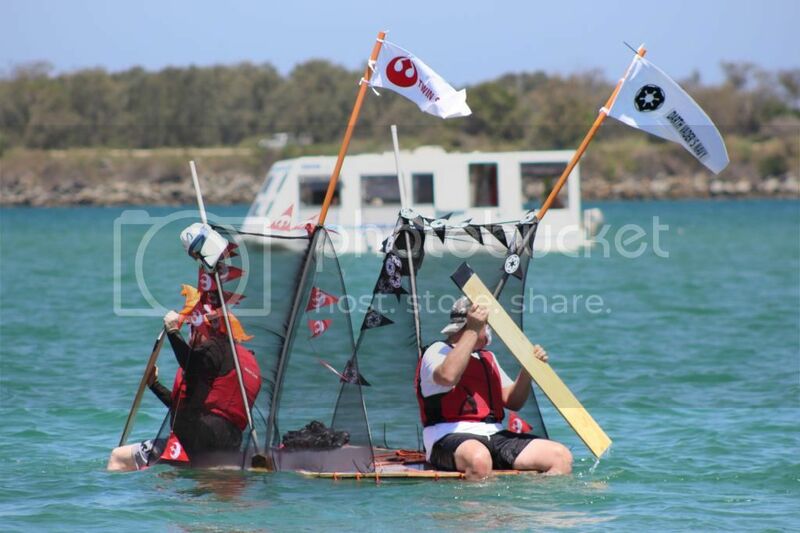 Ratchett and Rhino did an amazing job of building a kit raft and decorating it with Star Wars inspired bunting, Tie Fighter ‘wings’, figureheads and flags. 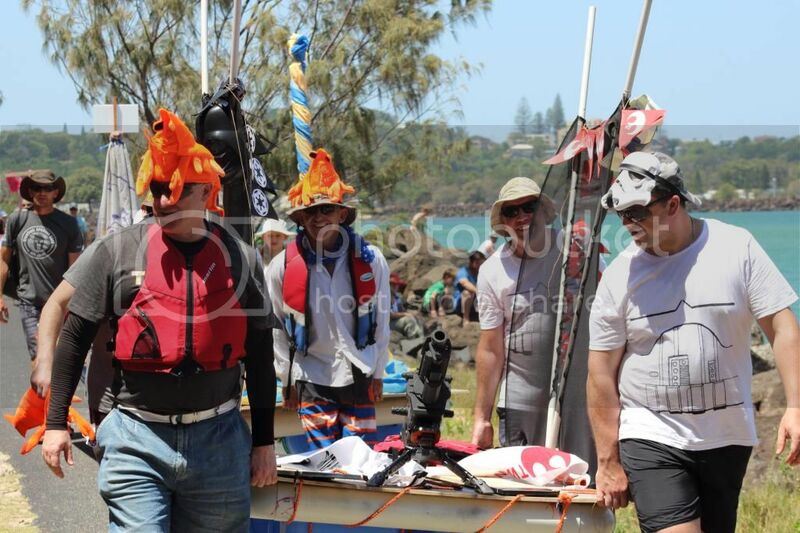 The 4 gents carried the finished raft to the water where Stormraven and Ratchett launched, paddled, overturned, righted, and finished the race, for the glory of the Empire and Rebellion! They didn’t come first, or last, so that was a relief! After much food and water was consumed in the day, the troopers said their goodbyes and returned, exhausted, to their transportation for their journey’s home. Some had a lot further to go than others, but all agreed the event was a great one and our presence in the Galactic town of Ballina was much appreciated. Mission Status: Complete success! The parade was small but colourful and we were a popular addition to the line up. 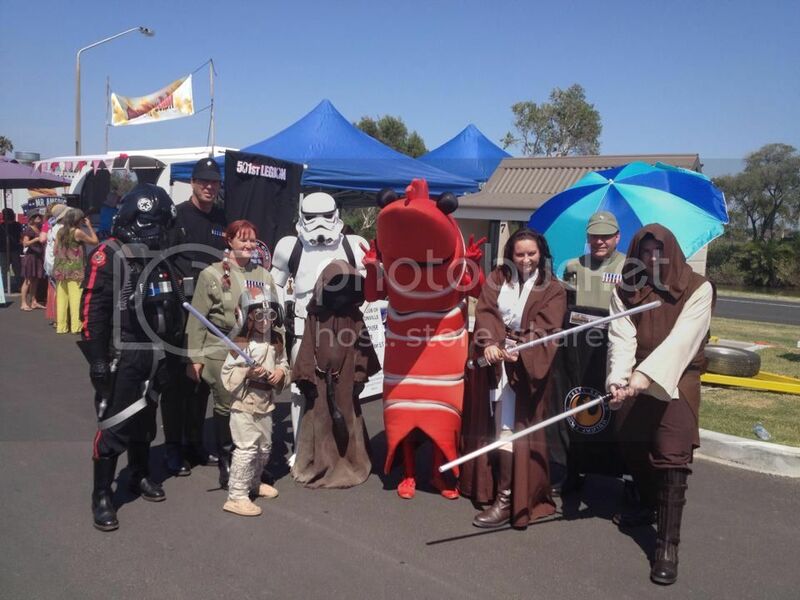 Many photos were taken with the troopers after the parade as we walked through the festival. The organisers were delighted with us and by all reports next year’s event will be bigger than ever and we will be invited back. We can only cross our fingers for cooler weather. 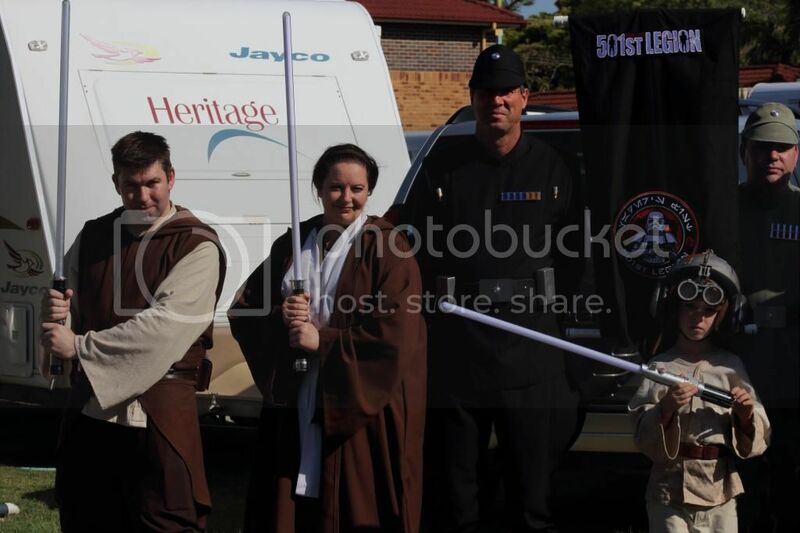 A few business cards were handed out, we chatted to a few locals and told them about the clubs, so hopefully we raised the profile of the Rebel Legion in northern NSW. As a side note – this troop really showed what Legion/Garrison cooperation can achieve. 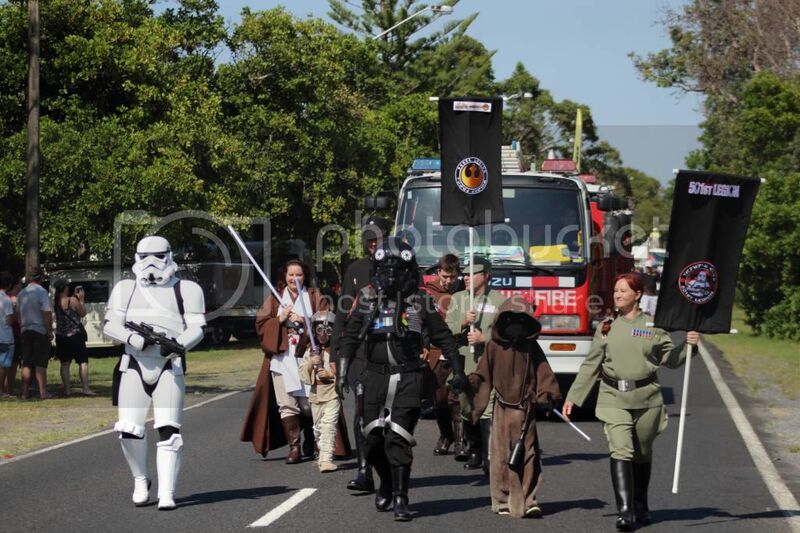 As well as 3 troopers coming down from Qld, Tappa from SCG, in his first troop, travelled a 6 hour round trip to join in. Rhino also came down from Tween Heads for his first official troop. The comradery and cooperation between the 3 clubs present and the GA’s was excellent. It was a pleasure to get back to grass roots trooping in a place where our presence was appreciated, with no politics or fuss. Great organisation by TK Ratchett and Chookie, who hosted 3 of us at their home also. Very generous and we all had a great time. Rebels represent, and how great is Galactic Academy ‘Mav’ with his Pod Racer Anakin. That Dune Sea looked pretty inviting by the end of the troop! Looks like everyone had a blast. This was a great little festival, and well worth the trip down. A big thank you to Chookie and Rachet for opening their house to us Northern troopers their hospitality and camaraderie really made this troop a really pleasant experience. And I can see the event only getting bigger. The raft race was a blast but it wasn't till we got into the race that Rachet and I found out why Rhino didn't want to go out in the water, it turns out he had "accidently" drilled some hole in the flotation drums and so they filled up pretty quickly but all was still going ok until we hit a cross breeze and tipped over, but at least the water was cool. But I have to say the real trophy of the weekend was the Prawn hats, Bunnings gave out 150 of them and before long people were trying to take ours off us. But I kept mine....and will be bringing it back to next years event. What a fabulous time you guys had. Congratulations to everyone that played a part in attending or organising this event. You did such an incredible job particularly in such extreme weather conditions and have done the 501st and Rebel Legions proud. It is such a validating experience to see inter club collaboration and hospitality, Thank you to everyone who had attended in getting our names out there. our collective efforts helps us all and that type of activity is mutually beneficial especially in the eyes of the public and promotes both of our clubs as being great clubs, with a great culture and great people doing great acts of charity. it's times like these that I'm proud to call myself a rebel and really makes my desire to become a member of the other star wars clubs. Great work and hopefully next year we can get road trip happening to attend this event.